The blood of someone with hemophilia will not clot normally. Bleeding may occur spontaneously or following injury.Hemophiliaoccurs in 2 forms, hemophilia A and B. In both forms, a gene is defective. The defective gene interferes with the ability of the body to produce the clotting factors that allow for normal clotting. The result is a tendency for abnormal, excessive bleeding. · With either disorder, you may show a mild form in which bleeding occurs only under severe stress, such as major injury. o Moderate cases rarely will have spontaneous bleeding but will bleed after surgery or trauma. o Severe cases will exhibit spontaneous bleeding-that is, bleeding without any recognizable trauma. Spontaneous bleeding can occur in any part of your body, but it is usually in the joints of the fingers, wrists, feet, and spine. ·The transmission of this gene to offspring accounts for 70% of the cases of hemophilia. The remaining 30% occur from spontaneous changes in genes responsible for causing hemophilia. Blood in the urine (hematuria) commonly occurs with hemophilia. Bleeding into a muscle usually follows trauma. Common sites are the thigh,calf, and forearm. What Causes It? :Hemophilia is an inherited disorder that mostly affects men. Women rarely have the disease, but they are carriers of the condition and can pass it on to male children. About 30% of patients with hemophilia have no family history of the disease, and it seems to occur as a result of spontaneous mutations.Who's Most At Risk? :Hemophilia affects people from all ethnic groups. The daughters of men with hemophilia will be carriers. However, even if hemophilia runs in the family, only about half of the sons of carriers will have hemophilia.What to Expect at Your Provider's Office:Health care providers usually diagnose hemophilia before birth through a blood test. After birth, the first sign of hemophilia is often deep and easy bruising as an infant is learning to crawl. For male children, heavy bleeding after circumcision may be the first sign of the condition. Your health care provider may diagnose cases of mild hemophilia even later, after a tooth extraction or following surgery. During a physical examination, your health care provider will take a family history and check for deep bleeding, muscle spasms, limited joint motion, joints that are warm and enlarged, and bruises. Blood tests can show whether clotting factors are low or missing. Your health care provider may request computed tomography (CT) scans and magnetic resonance imaging (MRI) to find bleeding in the joints. Administer factor VIII or IX (see below) on a regular basis, to help prevent bleeding and joint damage. Avoid circumcising male infants of women known to be carriers until the baby has been tested for hemophilia. Carry information at all times identifying the person as someone with hemophilia. Hemophilia Treatment-Self-Care at HomeMost often people with hemophilia require medical treatment if bleeding or an injury occurs. You can take the following simple actions at home. MedicationsTreatment of hemophilia aims to stop your bleeding. Doctors stop bleeding either by overcoming the deficiency in the clotting factors or by aiding in blood clotting. Giving a medicine called DDAVP (Octostim) may increase levels of Factor VIII (8) temporarily. But the medication will not be effective in severe cases of hemophilia or in hemophilia B. You may be given an IV infusion of factor. You are given purified Factor VII or IX (9) depending on the type of hemophilia you have. During the late 1970s through 1985, up to 60% of severe hemophiliacs had contracted the HIV virus (the virus that causes AIDS) from blood products. Because of the development of genetically engineered factor and improved purification processes, no case of HIV transmission from clotting factors has been documented since 1986. The primary treatment for moderate-to-severe hemophilia is factor replacement therapy, which replaces the blood's deficient clotting factor. You may receive the treatment to stop bleeding or to prevent bleeding from starting. Regular infusions of clotting factor several times a week reduces the risk of bleeding. You may get infusions at home. Your health care provider may also prescribe pain relievers. If internal bleeding has damaged joints, physical therapy or, in severe cases, joint replacement may restore function. Hemophilia requires conventional medications. When you are bleeding or have joint pain or swelling, get medical help immediately. Some CAM therapies may be helpful when used with conventional care for certain symptoms. For example, some mind-body therapies may help relieve stress and anxiety, which can reduce bleeding. Studies even suggest that hypnosis may reduce (but not eliminate) the need for blood transfusions. Several preliminary studies suggest that those who have learned self hypnosis need far fewer blood products over an extended period of time (2 - 3 years) than those who have not learned the technique. One study included relaxation training along with hypnosis. Published and unpublished reports on individual patients also suggest that hypnosis may help blood clot better and may reduce the need for blood transfusions. No studies have examined the link between nutrition and hemophilia. However, you should avoid vitamin E and fish oil supplements if you have hemophilia, as they seem to increase bleeding time by keeping platelets from clumping. Vitamin K plays a role in normal clotting and may be useful either from dietary sources or in supplement form, but research is needed in this area. Do not take vitamin K supplements without first talking to your doctor. Since herbs can affect clotting in one way or another, people with hemophilia should take herbs only under a doctor's supervision. Few studies have examined the effectiveness of specific homeopathic remedies. However, several case reports found that the following remedies were helpful for people with hemophilia and even reduced their need for blood clotting substances like factor VIII. Before prescribing a remedy, homeopaths take into account a person's constitutional type -- your physical, emotional, and intellectual makeup. An experienced homeopath assesses all of these factors, as well as any current symptoms when determining the most appropriate remedy for a particular person. Arnica -- for internal or external bleeding immediately following an injury. It is helpful for shock or trauma. Carbo vegetabilis -- for people with pale skin and weakness who are extremely frail, even listless, but like cold and fresh air. Crotalus horridus -- used when there is bleeding into the muscles and when blood appears thin and dark. This remedy is most appropriate for people who are tall, thin, and pale and have diarrhea and an aversion to warm food and drink, or may have fears of being alone and death. Hamamelis -- for bleeding from a cut or wound, especially useful in nosebleeds, hemorrhoids, and broken blood vessels in the eye. Lachesis -- for heavy bleeding that is dark in color, especially in red-headed individuals who are jealous and depressed. Millefolium -- for internal or external wounds with significant bleeding and poor clotting. Phosphorus -- for frequent, heavy bleeding. This remedy is most appropriate for people who have cold sweats and desire to drink alcoholic beverages. The person may also feel as though clothing aggravates the throat. Secale -- for bleeding that is worsened by heat and lessened by cold. Acupuncture is not recommended for people with hemophilia because of the risk of bleeding. If you choose to try acupuncture, work with a trained, licensed acupuncturist who has experience dealing with hemophilia. Laser acupuncture or acupressure may be better for those with hemophilia. Work with your health care provider to develop a program that is best for you. You should use the routine for at least 6 - 9 months to treat chronic joint inflammation and to prevent severe bleeding. 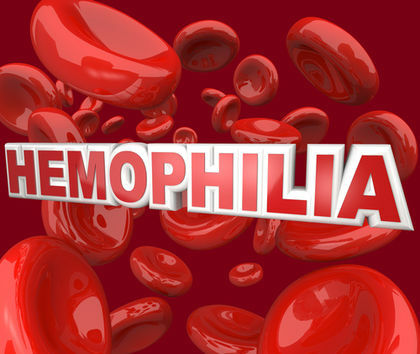 Most people with hemophilia can manage their condition and lead normal lives. In people who do not receive factor replacement therapy, however, complications include the destruction of bones and joints, life-threatening cysts, bleeding in the brain, gangrene, bleeding into muscles causing damage to nerves, long term bruising, and anemia. Sudden bleeding can occur with emotional stress. Although contracting HIV from blood products is rare, about one third of people with hemophilia (between the ages of 21 - 60) are infected with HIV. Elderly patients with hemophilia may have more co-morbidities and problems with daily living, but similar cognitive status as age-matched controls.